O passeio vale a pena por conta do Castelo de Peles e a cidade de Brasov. O castelo de Gran deixa a desejar. Mas, o ponto fraco da excursão foi a guia que não demonstrou profissionalismo, uma vez que não atuou como guia, inclusive desvalorizando o próprio passeio. Não nos pegou no hotel, apesar de sermos apenas duas famílias. A outra pegaram e deixaram no hotel deles. Eu não gostei do serviço da empresa. Não recomendo. This trip to Dracula Castle, Peles Palace, and Brasov were really great! We didn't get the chance to visit Peles Palace since it was closed on Mondays and Tuesdays. Our guide is really knowledgeable and helpful in providing information on the history and castles/towns themselves. Since those places are very hard to visit on our own, I think this kind of trip is perfect for people who want to spend some time in Romania Transylvania region but do not have a car and would like some professionals to take care of the rest. I would highly recommend choosing Viator as an option to visit these places! This tour is perfect, very comfy and able to experience the best of countryside of Romania.The tour starts on time and it has a comfortable bus that took us to the castles. It will take you to a scenic drive. A few pitstop for coffee breaks. Very knowledgable tour guide. Highly recommended for those who wants to see the best of Romania! The tour is good. The only problem I had with it was the people there also at the newer places. First, a pack of kids pushing by our entire group in the line to see things as if it were a race, with seemingly no adult supervision at all. But that's not my tour operators responsibility. Just my experience. In looking in the doorways (you weren't allowed in many rooms), one would turn around to be met by someone who was hostile to you because you spent (GASP!) FIVE WHOLE SECONDS looking in the doorway, and their precious Jean-Luc had to wait their turn. The other thing is...what sense does it make to convene your group in packed area? STOP DOING THAT! You can convene your group a whopping 10 feet away and accomplish ALL the same things without getting people pressed. Convening your group at an ingress/egress is a sign of lack of intelligence. Stop doing it. Great day out, a very long day about 14 hours but well worth it. We visited Peles Castle which was stunning, then Bran (aka Dracula's castle) great fun and finally went to Brasov. Roxanna our tour guide was very professional and pleasant. She gave us some interesting facts on the way to these places. I thoroughly enjoyed the trip. Also, Viator were great in giving me a refund for one person as my friend had an accident the day before and unfortunately was unable to make the trip. Would definitely recommend! Professionally run tour. Stops were well spaced and just the right amount of time at each stop. Full day. Don’t come to Bucharest and not do this tour. Great trip. Two beautiful castles and the outstanding town of Brashov. 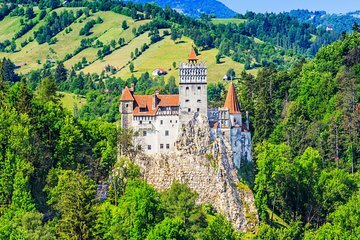 However do not be mistaken - Bran castle has nothing to do with the fictional character of Dracula or the real historical person who is known as Vlad the Impaler. It is a very long trip (we took nearly 16 hours) but if you can put up with the long day it is certainly worth it. The stops on the tour were great and the tour guide was very knowledgeable. The stops at Castle Peles and Bran Castle were great. The stop in Old Town Brasov was nice, however, it seemed as though it was a lunch stop and time filler that was not needed as the day was much too long, 0700-2300 from pick up to drop off. Most of the day was spent on the bus between stops that included the Brasov tour.